Juliet was born on New Year’s Day with Down Syndrome. Immediately after she was born she had difficulty breathing, could not hold her temperature and was taken to the neonatal unit. She stabilized after a few days and came home a week later. Juliet’s physical therapy began almost immediately due to low muscle tone, but after a few years she improved and is now very strong. She also began occupational therapy to help with her fine motor skills, developing speech and learning some sign language. Although Juliet can understand most of what is being said to her, she struggles with communicating back. Juliet does know some sign language and uses her iPad with a special program that acts as her voice. In addition, Juliet has hearing loss and has endured six ear surgeries in her life to try and repair her hearing. At nine years old she was diagnosed with Graves disease which causes the thyroid to be overactive causing problems like increased heart rate, which if untreated can cause a stroke, hyperactivity, sleep and weight issues. She takes medication daily to combat this. Recently, Juliet was also found to have Celiac disease which means she must be on a special gluten-free diet. In May of 2016 Juliet was diagnosed with Epilepsy after several grand mal seizures and multiple stays in the hospital. These seizures and the medications used to treat them have had numerous complications like difficulty breathing and even liver failure. Juliet continues to endure seizures on a daily basis. Doctors are working hard to find the right medications to control these seizures but have not found the perfect treatment. Juliet struggles to understand why she has to endure so many tests and hospital stays. Her family hopes naturopathic therapy will help, but this type of treatment is not covered by insurance. 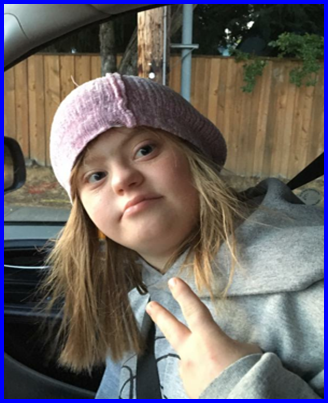 Despite all of these challenges Juliet is a spunky and funny teenager who loves wearing beanie hats. She loves music, looking at pictures, crafts and cheer. Like other teenagers, she loves listen to music and watch Youtube. Juliet will be adopted as a Sparrow to Aloha High School. Students will work hard to raise money for Juliet through sponsored community service and fundraising.